Kuber is a just launched new recharge app which we have verified and can assure you that Kuber app is genuine. Install apps and get credit instantly with Kuber app. This app also lets you do mobile recharge for your friends and relatives. 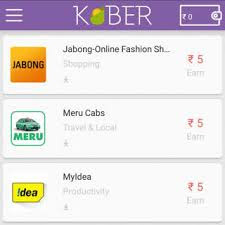 Refer Kuber app to your friends and get Rs 5 per invite. Having support for free talk time for all operators in India and you will experience a hassle free way to get a faster recharge. We have this easy trick for you, once you've downloaded the app where you can get free Rs 10 recharge. 2. Launch the app and enter your phone number. 3. Enter your details and tick to "agree t&c". 4. 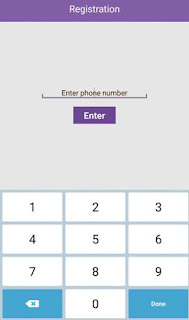 You will receive a one-time password (OTP) for verification. 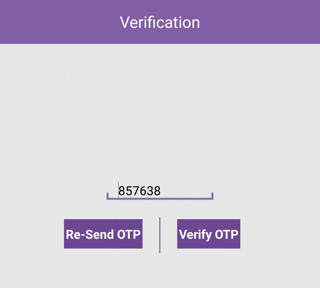 Verify OTP. 5. The main offer page will open with all the app offers. 7. You will Get Rs 10 free for installing two small apps. Visit top left corner menu. From there tap on "Refer a friend"
Send the referral link through various social apps. 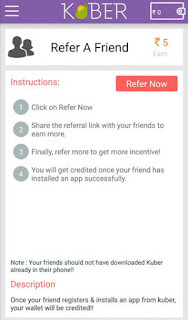 Once your friend installs Kuber app and completes an offer succesfully, you will get credited.